Turn your kitchen into a Valentine’s Day sweets factory with kid-friendly treats that are as fun to make as they are to share. My earliest Valentine’s Day memory is of my father giving me a velvet-covered, heart-shaped box of chocolates every February 14. It was heaven, in part because I didn’t have to share it with my three sisters, and in part because, well, chocolate. The thrill of the sweets may have quickly worn off after I discovered fruit-flavored cream centers (the worst), but the special feeling I got from my dad’s gift stayed with me long after the candy was gone. Now that I’m a parent, I still love the tradition of making someone feel special with Valentine’s Day treats, but we’ve given it a different spin in our family. Instead of store-bought sweets, we make our own to give out (and, OK, to eat ourselves, too). I love spending time with my son in the kitchen, and we have as much fun making candy and cookies as we do eating them. I’ve discovered, though, that the trick to kid-friendly sweets creation is to find easy recipes that kids of any age can actually help make, hands-on. So I avoid things like hard candy, which involves molten sugar that can scare even the relatively adept adult in me, and I focus on stress-free recipes and shortcuts. That’s how I make sure a labor of love doesn’t start to feel like forced labor instead. This is the perfect recipe to make with kids, especially if you’re looking for DIY food ideas for toddlers. The instructions are so simple, even the smallest hands can help out. The best part is when kids get to layer on their favorite toppings any which way they like. 1. Line a quarter sheet pan with parchment or wax paper. 2. Fill prep bowls with your favorite bark toppings; see above. 3. Place the chocolate in a microwave-safe cup or bowl. Microwave on high for one minute, and then mix with a heat-safe silicone spatula. (Kids of preschool age and up can help with the mixing.) Stir, then return to the microwave, heating in 30-second increments and stirring each time until the chocolate is smooth and the lumps are gone. You want the chocolate just warm enough to be melted, but not boiling, so stirring to get the correct texture is important. 4. Pour the melted chocolate onto the prepped sheet pan. Spread the chocolate into an even layer with a spatula. 5. Topping time! Take your prepped bowls of toppings and let the kids get creative, sprinkling their favorites across the top of the chocolate. 6. Finish adding the toppings within about 5 minutes after you’ve melted the chocolate, since that’s when it will start to solidify. Now it’s time to let it cool. Pop it into your refrigerator or a cold room. It will take about 30 minutes to set, and about 2 hours to harden. 7. To serve and eat, break the bark into bite-size pieces using your hands or cut it with a knife. Then portion it into bags and gift away. I’m a sucker for anything I can make hand-size for my son and his friends to share on playdates or at school. I love using my non-stick muffin pan to create portable snacks. These mini berry pies with their glistening red centers for Valentine’s Day use premade refrigerated pie dough, to keep the cooking-with-kids process totally stress-free. 2. Make the filling: Mix the berries together with the other ingredients. This is a fun way to teach little ones how to use measuring spoons. Then let the filling sit while you prepare the dough. 3. Make the hand-pie crust: Place the dough on the counter and lightly roll it with a non-stick rolling pin. Use a cookie cutter or a water glass with about a 3-inch circumference to press out rounds of dough (kids should be able to do this). You should get 12 from each sheet of pie crust. (If a glass won’t push through the dough, use a knife to trace the rounds; kids may need help with this part.) Line each cup in your 12-cup non-stick muffin pan with a piece of dough, by pressing rounds into each cup. 4. Take turns using a small cookie scoop to portion berries into each cup, to fill about ¾ of the cup. Then place a second dough round over the pie filling, crimping the edges together with the bottom round. Use a knife to cut small vents into the dough (bonus points for making a heart shape). 5. After you’ve filled all 12 cups, bake for 30 minutes. Remove the pan from the oven and let the pies cool for at least 10 minutes. You should be able to lift the mini pies right out of the pan. 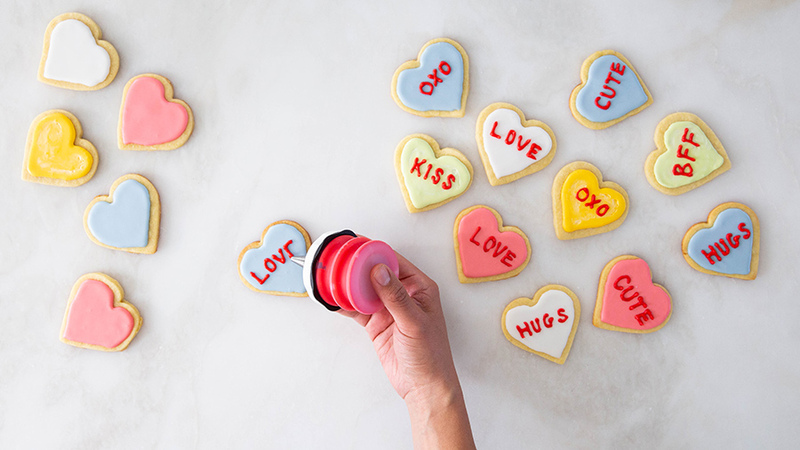 Tip: Add some extra Valentine’s love by using the heart disc from your cookie press. Then use a Baker’s Dusting Wand (the best kitchen tool you never knew you needed) to dust powdered sugar on top. Oh, conversation hearts: the candy that’s WAY more fun to look at than to eat. These pastel cookies offer up the same colors as their namesake candies, but have a deliciously rich flavor (as opposed to the purely sugary candy). These are easy to make using a cookie cutter or a cookie press and its heart-shaped disc. Check out this guide to how to use a cookie press for lots of useful tips. See this sugar cookie recipe for the basic ingredients you’ll need to make this recipe. 1. Follow the simple dough-making instructions (steps 1 and 2) in that same sugar cookie recipe mentioned in the ingredients list. In step 2, right after you divide the dough into two parts and before you wrap and refrigerate it, you can add food coloring if you’d like. 2. If you’re adding color: Gather either food dyes or natural colorings. Expert cookie-decorating tip: Use beet juice to mix up a red dye, turmeric powder for a yellow dye, and matcha powder for green. From there, you can blend other colors: For instance, mix the turmeric and beet to make orange. 3. Take each of the two dough portions you created in step 2 of the cookie recipe, and add as much of the dyeing agent as you need to get the color you want, mixing the dough as you go. Start slowly with just a few drops at a time to achieve a classic conversation heart pastel. 4. Now wrap and refrigerate the dough, as described in step 2 of the cookie recipe. Continue following the recipe instructions. In step 5, you can use cookie cutters as indicated, or a cookie press with its heart disc. 5. Chill the cut shapes and bake the cookies, just as it says in steps 5 and 6 of the cookie recipe. Keep a careful eye when these are baking so they don’t overcook, or you’ll lose the light pastel hue. 6. After the cookies have cooled, use a silicone decorating bottle kit with white icing to scribble classics like: I <3 U, XOXO, or Be Mine. Once the icing has dried completely, portion the cookies into cellophane bags to give away, or pile them up on plates to share. Feeling inspired to spend more time in the kitchen? Here’s how to make a truly impressive Valentine’s Day dinner at home.